For those friends whom you can always count on to wind down with a cocktail after a long day, this is the perfect gift for them. Personalize this colorful watercolor print with your pals' names and a cheerful saying, to celebrate the friendship you share. 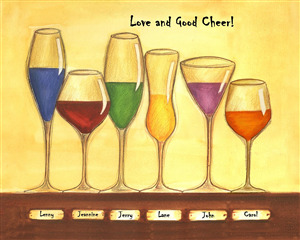 This wineglasses artwork belongs to our "Cheers to Friendship" art series. 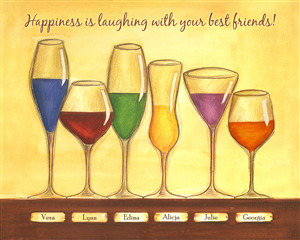 Each artwork in the series includes different number (from 2 to 8) of wineglasses to suit the number of friends in your circle. You may find them all in our Cuisine collections. I was very pleased with the way the artwork turned out on my computer. The colors came out bright on each wine glass. My girlfriend loved it! So fun and easy! Great personalized gift to share with best friends! !